Officer James Givens of the Cincinnati Police Department was initially amused when a mother goose wandered over to his patrol car and started pecking on the side. He figured she just wanted food. But the pecking continued, and as it turns out, the officer was in for quite the surprise! Officer Givens grew curious when the persistent goose ignored the food he tossed out the window. Instead, the bird walked away just a bit, then stopped, looked back, and returned to the cop car for some more pecking and squawking. After doing so for a second time, Officer Givens finally took the bait and got out of his car to follow the goose. But he wasn’t prepared for what he was about to find! Responses to "A Persistent Goose Leads Police Officers To A Trapped Baby"
but you cant make me believe the goose chose this person bc they are police. this goose chose a person in the area who just happened to be an officer. quite frankly were the officer in the area and not in uniform they orbly wouldve helped just the same. the emphasis on the person being an officer isnt necessary. stupid humans and their stupid litter. STOP WITH BALLOONS! Just so thankful for people like this. So cute how the rest just stayed int water waiting for Mum and sibling. People don't give animals enough credit...Geese are smart... When they fly in a V formation, if one of the geese is sick two of the geese will fly down with it until it's better or dies.. They mate for life and they are very protective of their young! So glad this little one could be saved! yeah, stupid balloons. Anyone else think it took FOReverrrrrrr to free geesey? Amazing story! In reference to "Anonymous'" statement... you can't make me believe the goose chose this person because they are police... the emphasis on the person being an officer isn't necessary. This wasn't the point. 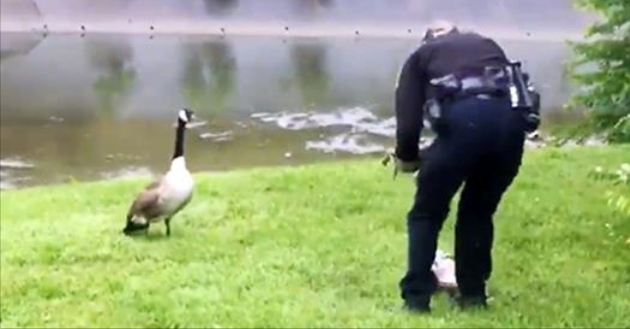 The author was pointing out the coincidence that the goose needed help, she looked for help, and the help ultimately came from a police officer. It was a clever lead in to the story, not a statement of fact that the goose knew and purposely chose "human" assistance because the people nearby were police officers. Just enjoy the story and the wonderful opportunity these officers had to show their community spirit and support of "life" be it human or animal. Police are often shown in poor light. They deserved the spotlight for this. Good for them for listening to the distress calls of a panicked mother bird. There was obviously some sense of trust the goose felt with these individuals and her instincts paid off and her baby was saved. Animals are much wiser than people give them credit for. It has been documented many times animals of all kinds seek people out in times of need. I guess they must feel we should be good caregivers on this planet. hummm Really upper story thanks so much to the police officer who helped! blessings! Why didn't the asshat help the officer instead of standing off and videoing? Because he's stupid as indicated by portrait instead of landscape filming.